You are currently browsing the tag archive for the ‘national dog week’ tag. Welcome to a new year nearly three weeks in. The above is one of my favorite quotes because of its positivity. It reminds me that even a day that brings sadness and bad news contains something that is good, even if we have to search for it. It also reminds me of the myriad of holidays and observances, much like National Dog Week, that ask us to consider a topic we might otherwise overlook whether it be social causes, lesser known diseases and challenges, a forgotten figure in history, food and beverages and of course occasions that celebrate and honor our pets. January presents among other observances National Train Your Dog, Walk Your Dog, and Unchain a Dog Month, Change a Pet’s Life Day and the lighter Dress Up Your Pet Day. It occurs to me that Walk Your Dog and Unchain a Dog Month present two sides of the dog-human connection, while at the same time asking those who are good dog-guardians to be even more caring and engaged. Dog walking seems like a simple act at first, but the “art of dog walking” differs depending on where one resides. Suburban dog owners with large fenced-in yards may simply open a sliding glass door each morning to allow their dogs outdoor time. This may be ideal, but don’t forget that your dog(s) may become bored at times and might wonder what lies beyond that tall fence. Getting your dog out and about helps with socialization and may be good for their humans as they get some fresh air and exercise. Ironically many city-dogs may enjoy more walks than their suburban cousins, but those dogs must master elevators and stairwells and good timing. On the other paw, dogs of those who live in more rural areas may never see a leash, or don’t require a fenced in yard. These dogs wander leash-free and hopefully safely each and every day. Sadly, some people still believe it’s alright to chain a dog in their backyards in the heat of summer and during frigid days and nights. In many cases these dogs have little access to food and water and live sad and lonely days. Many states have passed laws that give law enforcement the ability to take action to protect and rescue these unfortunate dogs. If you see a dog suffering please check with local authorities to see how you can help. As for Change a Pet’s Life Day, I still hear people saying that shelter pets are somehow damaged goods without realizing how much these pets need another chance at having a good home and family. It asks potential pet owners to consider that when seeking a new family member. Dress Up Your Pet Day encourages the more playful and fun-side of having a pet, and as many of us in pet-writing biz know, pet-couture is a big industy filled with creative individuals. If you’ve ever witnessed a pet fashion-show, you can’t help but smile at the models on the run-way and appreciate the fact that many of these events raise funds and awareness for good causes. And of course whether welcoming a new pup or an older dog to your home, set aside some time to work on obedience training, and seek professionals who can help develop good life-time habits that will strengthen the dog-human bond. My foster-to-furever dog, Teddy celebrates 6 years with us this month! He tolerated Dress Up Day! The Dog Days may have officially ended, but the “Dog Daze” loom – can you believe National Dog Week – seven days of pure canine celebration – will observe its 90th Observation the week of September 24th? Yes Virginia, there really is a Dog Week and if it had its own Santa, it would be Captain Wm. Lewis Judy, best known as Will Judy, the individual often cited as The Man who Brought America to the Dogs. As his biographer, I would be remiss if I didn’t tell you that you could “read all about it” in a book I wrote titled Dog’s Best Friend: Will Judy, Founder of National Dog Week and Dog World Publisher (McFarland & Co. – 2014). If your school, or community library, doesn’t offer it, I hope that you’ll request that they acquire a copy, or two. With over 1,000 footnotes (I’m still recovering) it offers an overview of Judy’s publishing career told through his magazines, books and his never-ending promotion of his beloved National Dog Week launched in 1928. To help keep the Week of the Dog a relevant part of American History, I launched a blog in 2010 (due to book writing my posts have been infrequent but I do hope to change that) and a Facebook Page to connect with dog-loving readers. Judy was also an art lover and promoted artists (as well as authors) whose work embraced that special dog-human bond. To that end, I created some art of my own that captures the enduring spirit of National Dog Week and all that it encompasses and Judy’s undying patriotism. Someone once referred to me as the “Wizard of Dog Week” and that made me laugh. I sometimes get messages addressed to “Dear Sir” – from those who think Will is still with us sitting behind an Internet Wall dispensing “wise” observations about the role of dogs in our lives. Even as early as the 1930s, Judy was aware that dog-centric topics could be wrought with contention and controversy, but he handled his detractors with dignity and humor. Like Judy, I’m both encouraged by news items and incidents that inspire the world in the Ways of Dog; alternately dismayed when I see how far we still have to go on the path of enlightenment. The latter was never lost on Captain Judy. But he never gave up the good fight – trained in the ministry in his youth, he retained a unique spirituality that permeated his writings and approach to the dog-human bond. Dog Week is YOUR week. Throughout the month of September, leading up to its 90th appearance on the American calendar, I’ll use its Community Facebook Page to offer excerpts from Dog’s Best Friend (and some of my other books) as we honor Dog Week’s rich and poignant history – a week that still calls for collective thoughtfulness and action on behalf of our beloved canines. Please join us by “Liking” the official National Dog Week Community Page, https://tinyurl.com/y8o4mxzv share your love of all things dog, and become an active part of the observance’s unique history. I hope my Writing Story and works inspire. Thank you. A New Look for the Week of the Dog! Welcome to the 89th Observance of a special time called National Dog Week. In searching for a quote to begin this post I opened my dog-eared copy of Will Judy’s Don’t Call a Man a Dog, 1949 (for it would be insulting to the dog) to let that quote find me! Please Note: Today, many dog-lovers don’t like the term “dog owner” however, many years ago, the Timeline of the Tail Wagger was still evolving and that term was commonly used. The sentiment, no matter the wording, still stands stronger than ever. Captain Judy was trained as a minister, became a decorated WWI Veteran, lawyer and one of America’s most prolific writers. He published Dog World Magazine for several decades, influencing a new generation of dog-lovers and enthusiasts. Judy saw the value of artists and authors and was happy to include them in his magazine’s issues and campaigns to promote National Dog Week an observance he launched in 1928 just before the nation was plunged into the Great Depression. But how could a dog get a week when most humans couldn’t get one day? Captain Judy understood the power of the paw and prevailed and in that continuing spirit, next September, National Dog Week will celebrate 90 years of honoring the American Dog. I’d love to see it celebrated in the spectacular fashion it once was on the grounds of Rockefeller Center and elsewhere. Suggestions on how to maket that happen are welcome. As one young man suggested the other day, it should be International. I’m happy to report that I often hear from people over the world sharing their stories and photos of their pups. This year, we’ve introduced a new logo. The image of a happy hound proudly posing against the backdrop of red, white, and blue is wishing on a star for so many reason. We hope you find it hopeful and inspiring at a time when something so “simple” as a dog’s love can help so many get through difficult times. So come tomorrow, try to be the god your dog thinks you are (if only for a week)! Happy National Dog Week – Let’s keep its spirit alive year-round – 52/12! Five years ago today, we said farewell to our beloved Portuguese Water Dog, Hooper. Named for the Matt Hooper character of the blockbuster movie Jaws, she really did drive the boat, our house, our lives. On a cold night in the winter of 2010, “Hoop Girl” was sitting by my feet at the moment I happened upon something called National Dog Week, a quirky yet poignant Canine American Holiday established in 1928. I fell in love with its colorful history, and began writing a biography about its Founder, Captain Will Judy, chronicling its unique, roller coaster-like legacy. In doing so, a new career was launched, and five books later, I’ve never stopped writing. It seemed like a strange way to say goodbye to a loyal and loving companion, but in true dog-like fashion, within five months, my heart-felt request was granted when we fostered a little black and white Havanese-mix named Teddy. Teddy came to us like a bright light in a bleak post Hurricane Sandy landscape. He wasn’t intended to stay, but stay he did, and has brought us much happiness. “Steady Teddy” couldn’t be any more different than “Hyper Hooper”. And unlike Hooper, Teddy adores other dogs. Now, with us for nearly four years, Teddy sits by my feet and inspires me to keep on writing, in fact, a story I wrote, based on his arrival in our lives, will be part of an Anthology released by the Revell Publishing group in October 2018. When the editor titles the book, I will let you know! And another interesting thing happened with the Tedster by my side. I revamped my art studio and did something I’d wanted to do for a very long time, paint my first pet portrait. The painting of Teddy featured above, draped by the American flag, brings my creative life full circle, and reminds me why I continue to write about dogs and history, or anything else that inspires me. It also captures the spirit of National Dog Week that was established to encourage a collective and thoughtful period when we are mindful of all the ways dogs enrich our lives. There are many exciting things going on in the Creative Front, and we’re working hard and visualizing some good days ahead; creating during challenging circumstances when the sun is temporarily hidden by fleeting clouds; welcoming the positive influences and encouragement from a dog that’s been sent to help makes it all worthwhile. That’s the ultimate gift. The 89th Observance of National Dog Week will be celebrated the week of September 25th this year! February is Spay and Neuter Awareness Month and Prevent a Litter Month, making Sunday, February 12, especially memorable for me, when I attended the Dog Writers Association of America’s Awards Banquet in New York City. Late last year, while filing entries for the DWAA’s Annual Writing Competition, I entered a blog post I had published in August 2016 to be considered for the North Shore Animal League America Special Award for a piece titled “Desert Paws” about a successful Spay and Neuter program in New Mexico. Unlike entries in the Regular Categories, the names of those who receive a Special Award/Grant are not revealed until the day of the Awards Banquet. I knew, for instance, I had been nominated in the Art and Short Fiction Categories, and that alone was truly exciting. At the event, I was also fortunate to be part of a speakers panel featuring Carol Bryant of Blog Paws, Maggie Bradburn Marton, Amy Tokcic for a writing seminar offered by the DWAA. Topics included navigating the publishing industry, pet blogging and utilizing Social Media effectively. I was also thrilled to receive a Maxwell Medallion for my Short Story Second Chances and also presented the first-ever Captain Wm. Lewis Judy Award to Bud Buccone for his video, “My Buddy” honoring Military Dogs of WWII! I haven’t blogged much these days as I’ve been focusing on book length projects, however, if my posts can make a difference, I hope to do more of this in the coming year. Preventing unplanned and ultimately unwanted litters of cats and dogs is the truest rescue there is. There will always be displaced and unhomed companion animals, however, if the unplanned pet population is reduced through Spay and Neuter initiatives, those pets that find themselves without homes will be fewer in number and will benefit from healthier and happier shelter and foster experiences. Please support those who are working so hard to make the world a better place for humans and animals, like the folks at Desert Paws. It’s been a hot summer here on the East Coast. But nothing beats the heat of Chandler, AZ, the place to which I travelled for the Blog Paws conference in June. BlogPaws is the world’s only organization comprised of pet bloggers and authors. Although it was extremely hot outside, I heard so many cool speakers inside it was well-balanced! A shout out for the top-rate facility and gracious staff of the Sheraton Wild Horse Pass Resort. For me, it was a whirlwind experience; I attended many workshops and events and also got to participate in a Speaking panel and lead a lunch-table discussion. I was inspired by many and hope I was able to do so for others. Here it is now, the end of August and I spend my time working with my hardworking agent, Donna Eastman of the Parkeast Literary agency. We’ve got some interesting projects circulating and working as a team, we hope that the right editor will reward us and lend their expertise and experience to bring these books to fruition (that’s fancy-talk for grant us a book contract(s)). Who knows what fall will bring. I thank all of you who continue to be so supportive and encouraging. There’s also my work on behalf of National Dog Week and my promotion of Dog’s Best Friend: Will Judy, Founder of National Dog Week and Dog World Publisher (McFarland& Co., 2014) – the only account of Judy’s life and work ever written. It is filled with and interesting account of one man’s influence on America’s love-affair with its canines achieved through Judy’s prolific publishing, writing and editing efforts over the course of five decades. This year, we declare that National Dog Week begins on Sunday, September 18th. But, if you wish to begin on Monday, or keep on celebrating the following week…no one will fault you! This year’s theme? “Readers Unleashed: Promoting Literacy with K9s” where dog-lovers utilize the power of the paw to encourage literacy and strengthen the dog-human bond. Does your library welcome Therapy Dogs, or does your shelter allow young people to read to the dogs? I will also be guest blogging for the dog-loving folks at Tito’s Vodka for Dog People during National Dog Week. This all-American company founded by “Tito” Beveridge fifteen years ago is sharing its growth and success to benefit canine well-fare across the nation. I am currently preparing for the Seaside Park Art Show held on September 3rd in Ocean County, New Jersey, combining my “dog writing” and art as presented in the work below. I hope you enjoy this scene that captures the magic of a fleeting season. Happy “Dog-ust”. Preparing for my participation in the fast-approaching Cat Writers of America/BlogPaws Conference in Arizona this June, I reflect on the past six years and my own path to becoming an author. Back then, I wondered if I’d ever get a book completed, published and promoted, let alone be invited to talk about it at a conference! Today, I am happy to say that I have birthed five books, with several in various stages of production and review. Although my primary topic has focused on canines, and those who celebrate them, I am open to any topic that fascinates me including sports, history, and travel. While I have averaged a book a year, nothing has unfolded as planned, and in many ways, I feel I am just warming up and I didn’t even begin writing “siriusly” until 2010. Whenever someone learns that I am an author, they quickly tell me that their friend, or a family member, has written a book (congrats), or, that they, them, themselves, have a great idea for a book. In truth, many of these ideas are very good and have potential, but the big question is, how will they get their idea on the path to publication? If their book idea falls under the category of Non-Fiction (memoir, how-to, history) there is one phrase that separates the wannabe author from the true “story-teller” who is willing to go-the-distance and endure the rocky road to get it all down and done…the Full Book Proposal. I am always glad to help those in their authoring journey within reason, however, if they aspire to write Non-Fiction, the first thing they will receive from me are examples and templates for creating a strong Full Proposal, which typically is comprised of several parts that requiring a GREAT deal of thought, planning, research and editing. That Proposal, is your book’s blue print, and will also require something called a Query, a few short paragraphs that accompanies the Proposal – that will make an agent or editor want to dive in to your Proposal, and take your book out of the “Slush” pile. This is part of what I will be speaking about at the BlogPaws Conference in Phoenix come June, in the company of so many other bloggers, reporters, authors, publishers and social media specialists. As someone who has worked with agents, and publishers, I will be asking my personal partners in the publishing world for advice that I can share with those attending the BlogPaws Conference to help them to create strong, saleable projects. I will also discuss Fiction projects that have their own special guidelines. The CWA/BlogPaws event is open to anyone, at any level, who wishes to learn more about writing for the pet-industry, and beyond. Once you learn the basics of writing a great Proposal, Query and Cover Letter or a sensational Synopsis, the writing process will flow and if being a published author is your goal, you will be on the “write” path and enjoying the journey and all the emotions it is sure to invoke. My “T-editor” takes a moment to reflect! This summer, my thoughts are focused on dogs and travel. Having just returned from California, I had the privilege of signing copies of Around the World in 1909: Harriet White Fisher and Her Locomobile (American History Press) at the fabulous Bookshop Santa Cruz venue. 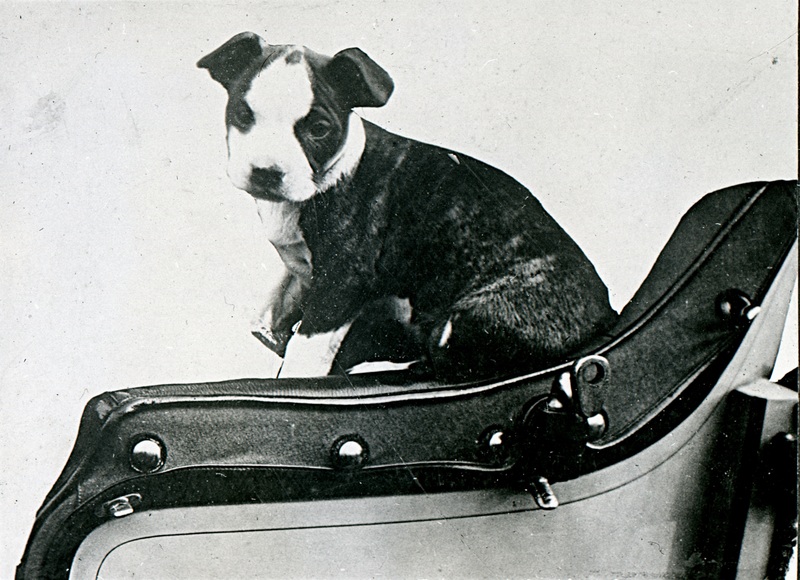 This story begins in New Jersey and meanders through the NoCal region so it was especially fitting, and of course it features the incredible Boston bull terrier, Honkie, the first dog to be literally driven around the world. In keeping with this traveling theme, I introduce a pair of sisters who have published a book that has Captured: The Look of the Dog in their own unique manner. Welcome Fern and Gloria! According to Fern and Gloria, dogs nationwide are begging their humans to read this book. Dog lovers and their best friends now have an evocative whimsical read. This collection of fictional short stories, poems, prose and faceted photographs expose the reader to a fanciful awareness of canines. It answers questions like, “Poo Diddy Poo?” – do dogs have bad hair days – including revealing details of puppy pee-mail. This book is essential for all dog lovers and pet parents! It captures the essence of dogs – the images itself are beautiful, and the copy is clever and very well-written. You can tell that the authors put their heart and soul (and paws) into this book – and it turned out wonderfully. It is a good read and not too long and not too short. It is just the right amount of each dog and their little story. It makes you laugh, smile and in some case sad or makes you think. This book makes you want to read more and get to the next dog and the next story. It captures your mind and in some stories your heart! Captured! is available via Amazon.com, barnesandnoble.com. If you are staying at a pet friendly establishment for the first time, make sure to ask them if there are adequate outdoor accommodations. You would think since they are pet friendly, they would have thought of the excrement ramifications, but don’t assume. There is nothing worse than being surrounded by cement or stairs or on the fifth floor when your Labradoodle has to diddle in a hurry. Speaking of the fifth floor. Be aware that all pet rooms/cabins are not created on the ground floor. Does your Border Collie know how to climb stairs? Is your Boxer afraid of being boxed in on an elevator? When that elevator door opens, my 90 pound hound mix charges inside, not caring if there is someone trying to get out of the elevator or if they are afraid of him. Find out what floor you’re on. A word about packing, well two words…extra towels. This is in case of rain or beach excursions. Wet-dog smell is never an air freshener scent. And another three words…extra dog food. You can’t always find your brand if you run out. When our moms told us, “wear clean underwear in case you’re in an accident” I think she meant in case you have an accident. For years I stuffed a pair of clean underwear in my purse just in case. Here’s a scenario. Dog travels in a car long distance for the first time, maybe excited, maybe nervous, maybe both. You have the dog in your lap or your dog leans over the front seat or you open the crate to let them pee and PLAHH. Your precious pup pukes on you and your clothes. Have a change of outfit handy is all I’m sayin’. Examine the room/house where you will be staying. Dog-proof it to eliminate potential disaster. For instance, dead lizards and bugs in corners should be removed to avoid consumption. Floor vases, tail height glass objects, magazines on coffee tables could be transferred to higher elevations. Be prepared for attention. Strangers may gawk at you like your clothes are on inside out. They’ll want to pet your pooch or feed ‘em while you’re dining. Hopefully they’ll ask permission first. Know what breed of dog you have. You’ll need to know this for curious minds. If you have answers ready you’ll me more relaxed. And isn’t that the goal of travel, to relax? Go for it. 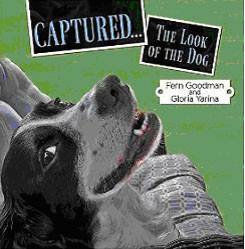 Thank you Gloria and Fern for sharing with the fans of National Dog Week. Safe travels to all! Help Pass the Anti-Tethering Bill in New Jersey! I know for many, holiday weekend plans are underway already, but I want to relay this message from my friend and fellow dog-welfare advocate, Janice Fisher Patterson, who is trying to garner support for a very important issue. I hope my dog-loving friends will help by calling, sending e-mails, and sharing. Did you catch Janice on a recent segment of Dr. Brian Voynick’s “The Pet Stop” on News 12 NJ, talking about the new Pet Shop Disclosure Law that was recently instituted in the Garden State? Thank you for your support. A two-minute phone call and e-mail to your state senator and two assemblymen will make a world of difference to dogs that are tethered 24/7 outdoors in the extreme heat and freezing cold. District 10 lawmakers, Sen. Jim Holzapfel, Asm. David Wolfe and Asm. Gregory McGuckin, have introduced a bill that will prohibit this cruel treatment of dogs. Besides being subjected to all types of weather extremes causing physical pain, animal attacks, disease and the threat of being stolen for dog fighting, these animals are usually deprived of human interaction, a cruel fate for highly social animals. Recently local towns have been adopting their own ordinances prohibiting 24/7 tethering, following a sad situation in Plainfield, NJ where a German Shepherd was left outdoors all winter long on a six-foot chain with only a wire crate for shelter. 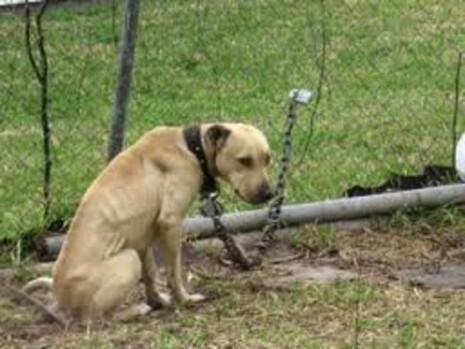 This is only one example of the neglect that these animals are exposed to at the end of a chain. These animals are NOT lawn ornaments and they must not be treated that way. PLEASE call first and follow up with an e-mail. We thank our caring government officials for promoting the welfare of our Companion Animals. If you have questions for Janice, or you are an animal advocate advocate outside the state of New Jersey, please contact me at pst39crd@aol.com. Thank you.